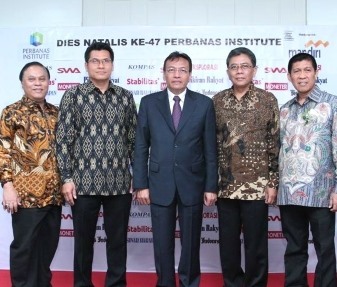 On 23rd February 2016, Perbanas Institute celebrated its 47th anniversary marking the leading institution’s numerous milestones since its establishment while striving to further elevate its standing in Indonesia’s higher education sector. The event was attended by Perbanas Institute’s Rector Prof. Dr. Ir. Marsudi Wahyu Kisworo, Vice-Rector of Academic Affairs Mr Patria Laksamana, S.E., M.B.A., Ph.D. and senior members of the Perbanas Foundation Education including Chairman Mr Sukatmo Padmosukarso. Several other prominent faculty members in attendance included the Dean, Heads of Study Programmes, Heads of Bureaus, and several lecturers as well as students. Perbanas started preparing for its 47th anniversary since year end 2015 by hosting student competitions in various categories such as basketball, futsal, stand-up comedy in addition to a journalism competition opened to the general public. Through the provision of these programmes, Perbanas highlights the extensive efforts undertaken to ensure its students are well-equipped with soft and hard skills. This in-depth understanding has led the way in strengthening Perbanas Institute’s prominent standing in Indonesia’s higher education industry. Rector of Perbanas Institute Professor Kisworo provided a welcoming speech highlighting the institute’s evolution to become a renowned higher education centre for finance and banking in Indonesia. To further solidify its skillset, Perbanas represented by the Rector signed a memorandum of understanding with a local media publication company, PT Nayottama Oetomo Sinergi during the event. In keeping with its forward-thinking strategy, Perbanas also announced plans to open a doctorate degree programme for the current academic year while the recently-launched Shariah Economics undergraduate study programme will begin enrolling students in September 2016. Perbanas’ 47th anniversary celebration demonstrates the institute’s commitment in moving forward with innovative plans to achieve its target of becoming a top banking and finance education institution in Asia by 2019.